MK Properties / Uncategorized / Where do you get your Income?…What if you lost it? After a very wet past few weeks, we are looking forward to the warmer weather and spending some more time outdoors! I can’t believe it actually hit 30 degrees this week here in the GTA! With the brink of summer on the horizon, we already have a few adventures planned with time to relax and also a small family getaway… more toward the “Live Life” side of our main slogan “Build Wealth – Live Life”. For this post I thought I would share what usually gives people that extra nudge and shift in thinking to move forward in real estate or trying something new: “Mindset”. 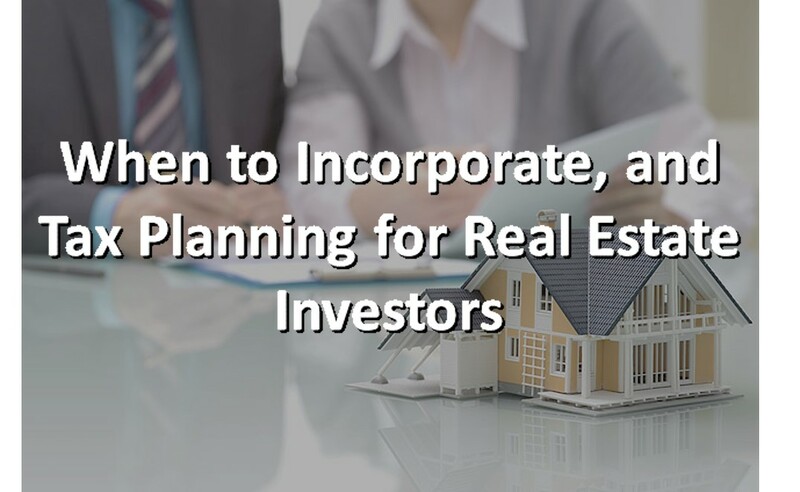 Although our blog is mainly about real estate, this post could be applied outside of real estate as well. Many of us have grown up with what society has taught us as the “right” thing to do (ie: go to school, get a job, buy a house and pay off debt, etc). It took me two decades to break out of that mindset. If you haven’t heard of Robert Kiyosaki, then perhaps a trip to google would help as he is a #1 selling author an educator. He has written many books on personal finance as well as mindset around money. However, there are 2 of his books that are key stand outs for me when starting out in Real Estate Investment, or for how many of us think about money. His book “Rich Dad, Poor Dad” is the #1 personal finance book in the world. I will not spend a lot of time on this book as it is widely known. If you have not read it, it is a fantastic book, not for the nuts and bolts of finance, but more around the mindset of finance, your relationship with money and how you view it. It goes into financial literacy and sheds some light on why the majority of our population could improve in how financially literate they are. Our schooling system unfortunately does a very poor job on educating us on just the basics of managing our own finances. We know of many high-income earners (ie: doctors and lawyers) who still live paycheck to paycheck and have large debts. There are many in our society that look to be quite wealthy in how they present themselves, put are actually struggling for long term financial wealth. E for Employee: This quadrant is where the majority of us fall into. In this category we are typically working for a wage or a salary. This could be teacher’s, managers, CEO’s, etc. Anyone working for someone else and getting paid for it. If you look at the core values of this quadrant, it is mainly “Security”, or having a safe and secure job with benefits. For us as Employees, we pay the highest tax rate to the government, and ultimately if the work stops, the money stops. S for Self Employed: For those that are self-employed, they essentially own a job. This could be real estate agents, doctors, those with their own practice, etc. For many that become self employed, they want to own something and believe they can do it best themselves. The self- employed are also taxed quite heavily and trade their time for money as well. Many big businesses can start out in this quadrant. B for Big Business Owner: Kiyosaki defines this as a business of 500 or more employees (I think it could be much smaller). The owners of Big Business obviously need something to sell, however are looking for systems, good infrastructure, and the best people to run the business. Rather than running the company themselves, big business owners look to scale larger than what they could do on their own. One major financial advantage of owning a business is the tax implications. By comparison, a person’s marginal tax rate could be upwards of 40%-50%, however the corporate tax rate in Canada is 15%, this represents quite an incentive as more money is left in your pocket from what you make. 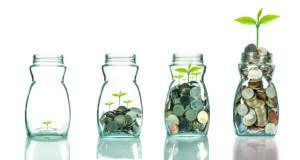 I for Investor: The investor quadrant has their money work hard for them. Similar to “B’s” the Investor also has significant savings in how earnings are taxed. With the right education, Investors could have passive income (or cash-flow) coming in regardless of their presence or involvement. The core values of both B’s and I’s are quite different from the E’s and S’s. They are not looking for jobs, they do not want to work for the rest of their lives, and hence want to have their money work very hard for them. Risk should be mentioned for any one of these quadrants as fear is what typically holds back most of us. For the educated investor or Business Owner, risk is something that could be calculated and also mitigated to drive both passive income as well as portfolio wealth. This is why I choose real estate as my preferred business as well as investment. I know my risks are low (even with a major market correction), and I will still be profiting regardless of the value of an asset. 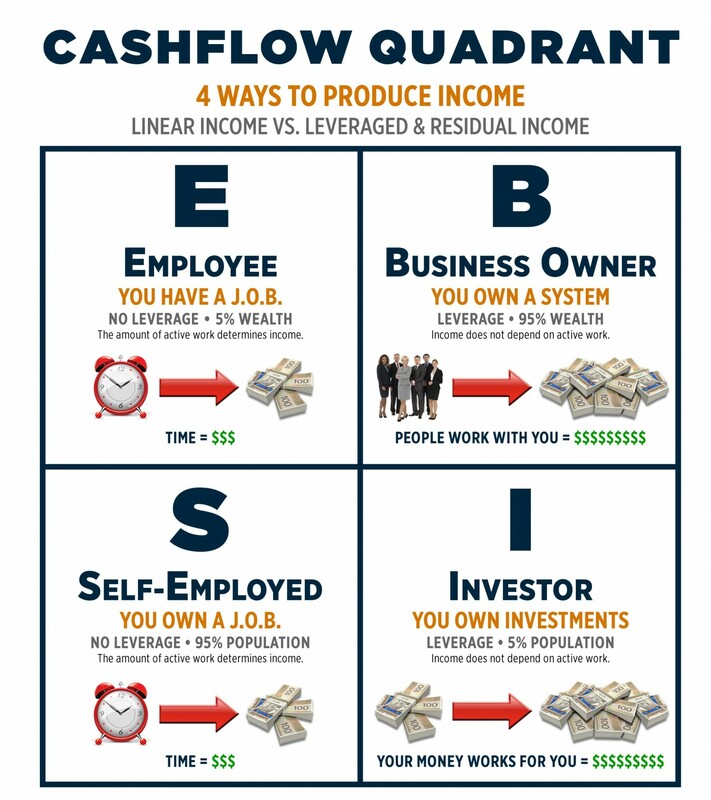 For many of us, we likely have some of our income come from multiple quadrants, as well as could have values that are in multiple quadrants. Ultimately, the purpose of this post was to try to shed some light that was instilled on me at a fairly young age: “Don’t rely on only one stream of income”. I was taught to focus on multiple streams of income. A good indicator of how well someone is financially is if their main income stream is suddenly shut off (i.e. : a loss of a job). What would their options be moving forward. This actually happened to be in my career where my employer restructured and I lost a high-level marketing position. It took me almost 2 years before I landed a similar role with another company. I for one credit having multiple streams of income (i.e. : my real estate investments) that kept myself and my family quite comfortable during that time.